“I Am the Queen” is a documentary film that looks at the transgender, youth beauty pageant. Contestants offer a glimpse of their lifestyle as they prepare to compete against each other. It follows Bianca, Julissa and Jolizza as they prepare for Paseo Borica, the pageant under the guidance of Ginger Valdez, an experienced transgender person from the neighborhood. They share stories of their transition, their family’s varying reactions, and how they find support from within the community. We see how family dynamics, cultural heritage, and personal identity all play a part in how the contestants face the daily struggle that comes from being true to themselves and who they are. Directors Josue Pellot and Henrique Cirne Lima, chronicles the journey of young transgender Latinas as they prepare for the Cacique Pageant, a transgender pageant that is organized by VIDA/SIDA in Chicago’s own Humboldt Park. The film begins with the pageant and the contestants making their grand entrances as they are cheered on by the audience and supportive family members (Yes, you read that correctly—“family members). The film then looks at the origin of the pageant. We see that it which began as a way to create a space for a community that is the most marginalized in society. In the beginning of the film we watch as the teen contestants talk about their experiences coming out as transgender to their families. As the film moves forward, they become comfortable with the spotlight as they discuss their prospects of winning the pageant, their relationships with their families, their aspirations for the future, their dating trials, and their relationships with each other. Julissa is 20 years old and tells us that she has wanted hormones since she was 13. While her mother Lisa responded angrily at first and refused to speak to her daughter, she soon realized if Julissa didn’t get the support she needed at home, she would “find it in the streets, and that’s the worst.” Lisa went on to accept her daughter, accompany her to her doctor appointments, and began calling her Julissa instead of Jonathan. She is okay with the whole business aside for her concern as to her daughter’s safety since violence against transgender women is a major issue. Julissa tells us that it was the pageant that released the inner Julissa and allowed her to come out. Her relationship with her family is very special and there are family members who blame Lisa for Julissa’s gender identification. The fact that she is accepted by most reminds us of how many are not. Jolizza, 19, a self-identified transsexual woman who was kicked out of her house when she told her mother she was transsexual. She shares that her mother, who is a lesbian, was accepting of having a gay child but not a transsexual one. Jolizza struggles to finish high School while working a part-time job and living on her own. Her sister is a tireless supporter, and Jolizza tells us about her relationship with “adopted” family members, people in the community who support her as a biological family should. The film only gives a brief glimpse of Jolizza’s family at the end and we really would like to know more. Jolizza takes us on a tour of her high school pointing out that she uses the girls’ bathroom and that people know better than to say anything because if they do they risk a fight with her. She also shares that the difficulty of being transsexual in a less than accepting world brings her to tears every night and this is quite different than the person we hear saying she would beat up anyone who tried to stop her using the girls’ bathroom. Bianca is a transgender teen struggling with a family who doesn’t accept her and she says that she “stays” with friends because of her home situation. Her instability in life is apparent and we see that in her journey towards the day of the pageant. 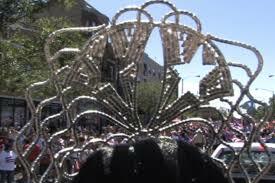 The pageant itself struggles with instability as half of the contestants drop out, leaving only four to compete at the end, including Allan, a self-identified gay male who dresses in drag for the pageant. There is a lot of humor in the film as we look at growing up and being themselves and there is also something to learn about what independent means for a young adult who is transgender. Both Julissa and Jolizza are moving and settling down in their own apartments. They are also making plans to go to college. We learn how the girls chose their names and we see the pressures that the pageant puts on them. Pageant coordinator and emcee Ginger Valdez is a dynamic and beautiful trans woman who came out at 14 in Puerto Rico during a time when it wasn’t legal. She tells us how she had been physically attacked by police for being transgender and she humorously shares what transgender women had to do back in the old days so that they would look like real women. Her stories show the contrasts between being transgender today and what it was like forty years ago. We also see Ginger preparing for one of her performances (and she shares some of her beauty secrets). There is an interview with the 2007 pageant winner Jade, a transgender woman who is active in her community and who describes the struggles of transgender women, the importance of visibility and spreading awareness, and her commitment to breaking stereotypes. The pageant comes at the end of the film—it is as if we have been preparing for it along with the contestants. When the winner is announced we are overjoyed while at the same feeling a bit sad for the two who did not win but placed as runner ups. I find it interesting to think what people some thirty or forty years from now will think about the film. Will it still be insightful and will it just fall by the wayside because transgender people have come into their own? Until there is mainstream acceptance for trans-identified people in this country, this film will seem like something of a revelation. For them, their lives are normal and I love that we see pride flags and other symbols of the LGBT community only for a short time as if to say, “Above all, before you’re gay, straight, lesbian or American even, you have to be Puerto Rican” and the emphasis here is not on the name but on those who represent that name. We do see that these three young women do have problems. Jolizza says that just riding the bus is hard and that she goes home sad every night. Bianca is in the midst of a transient lifestyle so we do not learn very much about her. 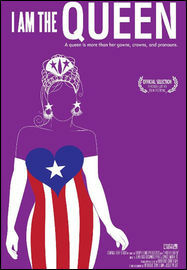 The film exposes the restructuring of the family unit experienced by pageant participants who are often distanced from their biological family but who find kinship among those facing similar experiences in the Puerto Rican transgender community and it is quite an experience to see. This entry was posted in GLBT documentary, GLBT Film on July 31, 2015 by Amos.